After responding to a distress call from a secluded psychiatric hospital, a young detective and her partner find themselves struggling to solve a murder. As they press the patients and hospital staff they find that there are dark truths being kept from them. Each new clue only raises more questions. Who killed Doctor Crow? What drove one of the male nurses insane? Who is Zed Rascov? Why is the name of a little girl, Ginger, carved into the wood-paneled wall of the dead doctor's office? Can you unravel the mystery? 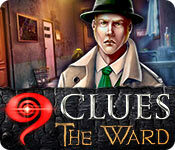 Find out in 9 Clues: The Ward! 9 Clues: The Ward is rated 4.3 out of 5 by 80. Rated 5 out of 5 by garhawk from What a Fun and Interesting Game! Due to having a credit you can only use on standard games, I found this one. I loved the storyline, voice overs and game play which I thought was original. The game was longer than I expected too! The graphics were okay; not as crisp as other HO's, but that's very minor compared to everything else. Great fun! 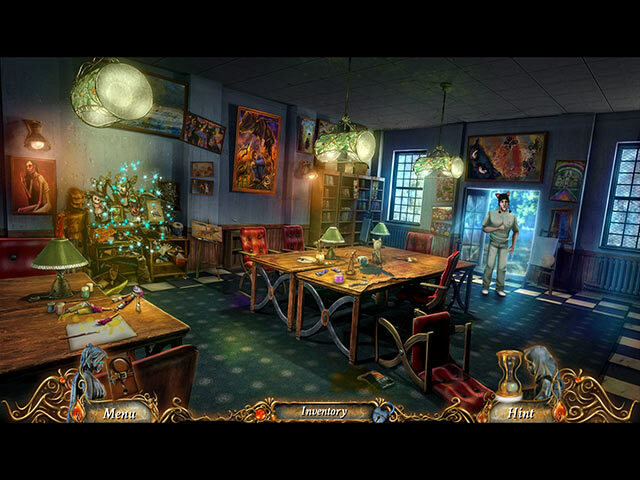 Rated 5 out of 5 by Celestien from Very nice, and with some original features I quite accidentally found this game, having played the other one (The secret of serpent creek) earlier and just trying to find a bit-of-spooky HO game. So it's already an older game (2014 apparently, seeing other reviews), but I still liked it a lot because: - I like a bit of cartoonish art work - The thrill of the asylum was presented very well - I really liked the detevctive mode that popped up in a few scenes, where I have to find every item in the room that could tell something about what had happened - for myself, instead of a list of items (there were plenty of that kind of HOS's too) - The storyline was done well enough with some expected ànd unexpected twists during the game - The story was long enough. I really enjoyed this. Well done! Rated 5 out of 5 by grunny50 from A real sleeper! What a great game! Bought it because I wanted something different, and this was it. An actual story line, with cohesive characters and no confusing octopus tendrils sticking out of crazy places (I get really tired of tendrils). This game had some pretty good puzzles and HOs, and the graphics, while not pristine, were very good for the story. I got hours of play out of this game, and will probably try the game that preceded it, just to see what the developers did the first time around. Great value! Rated 5 out of 5 by Shelly718 from CRAZY FUN! I'm a sucker for any game that takes place in a mental hospital (and I'm usually disappointed), but this was a genuinely fun and immersive game. Visually, it is outstanding, with high quality graphics that managed to look both real and slightly cartoonish (in a good way). The voice overs were nice, with not too much cheese. I loved that we had nice looking but not drop dead gorgeous leads and supporting players who could have been real people with real neuroses. The storyline was one of the most cohesive I've seen in a long while. I normally detest the HO scenes that are fairly inevitable in these games, but these were sort of "reverse object" which made it different and interesting, not so ho-hum. The only negative I have is that the puzzles were too few and too easy. Other than that, it's a little gem of a game. Rated 5 out of 5 by lilsysAZ from Great! I loved the story. The game play was fun. I liked the investigating. 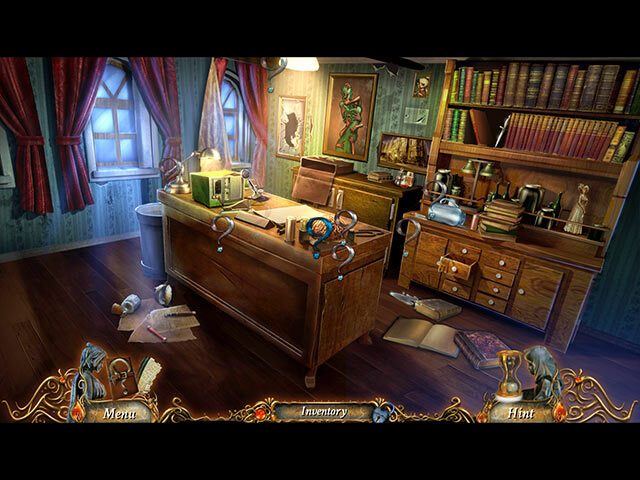 Hidden object scenes were different and fun! Rated 5 out of 5 by Alenee from Vintage cheese - and that's a good thing!! I downloaded the trial of this game and thought, 'oh my god, not another Chucky doll horror rip off'. I prepared myself to be disappointed in the game makers for the first time since I discovered AM. But I was wrong! By the end of the trial I was hooked... as I have been with the last 3 games I got from AM. 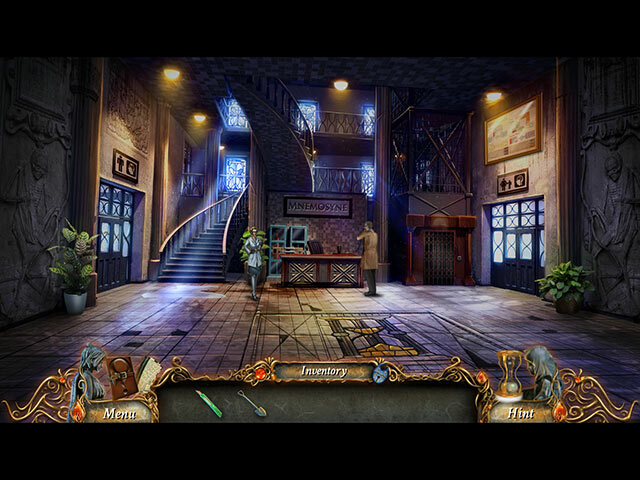 As usual they have snagged an overly familiar horror theme and brought it to life within a hidden object adventure, which really takes some doing. How? By bringing in original and lifelike characters, and creating weird, one of a kind settings that keep you guessing and detecting all the way through to the end. I love the fact that you always get a sense of being lost in an AM game! And this one is no different, as the scenes change around you throughout the game. The puzzles are frustratingly hard though, and a few of them have made me ask myself if there is any pattern to winning or not. A lot of guesswork on my part, but maybe I'm just not patient enough to pick up clues to the strategy...? I reckon AM should include a few more instructions in their next game. But, after playing 3 AM games now, I believe that the puzzles aren't even the main attraction - the stories are. I can't put into words why they seem so much more realistic to me than any other HOG's I've played but take it from someone who's tried a bit of everything: these guys are the best. And the art and music are always top, even though in this game, it was all a little bit too 'carnivalesque' for me. I'm still playing the game so I can't say how long it will take (the shortest game I've played from AM was about 5 hours though). But I am pretty determined once I get started - more casual players should take longer. Buy this if you've always been a fan of doll-based psychological horror flicks and wanted to play the hero(ine) in the film for a change. That's what AM does so incredibly well, and this is yet another success for them. It's especially fun to have the man playing the sidekick, as is the case in many of these games. All of the characters are real 'characters' and they're funny... and so is the asylum, come to think of it, even though it's creepy at the same time. Like one reviewer said, you wouldn't go there to get better! I gave 4 stars for the storyline and visuals out of my own personal bias. The Enigmatis games are way more my style. But I'm still hooked, and that's what matters, right? Great work, guys! Rated 5 out of 5 by MountainMama915 from One great game ... I loved it! Wow! Just finished this game and already I know I will play it again. (Next time I'll play in the hardest mode.) I absolutely loved this game. Recently played the first game in this seris, 9 Clues The Secret of Serpent Creek and I loved it so I knew I had to play this one too. So, so glad I did! One of the things I love about both these games is all the interaction your charactor has with all the charactors in the games. The charactors in this game were awesome. The voice actors who played the parts were fantastic, Their voices were very spot on and believeable, full of emotion when it was needed. Each charactor had their own personality which made them seem so real and life like. The storyline was probably the best I have seen out of all the Big Fish games I have played. I was just absorbed in it, wanting to know what was gonna happen next. Even though the plot was about arson and murder, I did not find it really dark or creepy. It was more like a whodunit movie script in my opinion. I did not want to stop playing but of course there always has to be an ending. And what an ending it was! Lots of twists and turns, very suspenseful. I thought it was a wonderful adventure and I highly recommend it to any and every one who loves a great game with a great storyline! If in doubt, try the demo and see ... Bet you're gonna love it! Happy gaming everyone! Discover the secrets that lie buried in the eerie, crooked halls of Mnemosyne Asylum!